It's official - the Cushing's mood swings are definitely back. I have cried for no reason, I've been mad at my family for no reason, and I just am having a hard time dealing with people. The last time my emotions were this unpredictable was right after my second pituitary surgery, which seemed to make my Cushing's symptoms worse. In just a few weeks after that surgery, I gained almost 20 lbs. I haven't seen the rapid weight gain yet, but I have had flushed cheeks and a red spot under my chin, acne, darkening of scars and stretch marks, worsening insomnia, curlier hair, and of course, the mood swings. 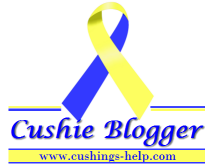 I have one more 24 hr urine to do, I am going to try to do that on Sunday while I am still having all of these symptoms, and hopefully those results will show what I already know, that Cushing's is back once again. I feel like after 3 surgeries, 2 that were not successful, and the 3rd which helped relieve all of my symptoms for almost 2 years, this is the hardest reoccurrence to deal with. I'm not sure if it's because I still look like myself, just a few pounds heavier, or that I know that there is no easy answer to fix this, or because it's harder for people to understand since I've learned that most people have stopped listening. I'm not sure to address this at work yet, to warn people, and explain why I might be extra sensitive, or if it would just bring added drama that I don't need. I'm so sorry! I'm just being diagnosed after seventeen years of symptoms. I'm Episodic so doctors failed me for half of my life. Will you get a BLA this time? i have actually already had a BLA, so next step if i do have cortisol production would be an ablation of any rest tissue we find. For work, if it were me, I'd tell my boss that you're dealing with medical issues (s/he doesn't have to know the details if you aren't close) you can even tell him you're on some new meds that are doing some funky things with your body and hormones right now. While its not entirely the truth, sometimes thats easier to explain than the complications and ins and outs of a pituitary tumor. I'd also alert anyone that you're close with at work. Then if you're having a really hard day they can be prepared and cover for you or help you. I'd tell them on one of your good days that way they won't be completely caught off guard when you have a really bad day. And you can even tell them you don't want EVERYONE else to know. Its a lot of work trying to act 'normal' and keep it together when your body is so far from it. You need a few people to lean on when you can't do it on your own. I think that was hardest for me when I was so sick. I'm very independent and very quick to pick up the slack when others fall short etc. asking for help and learning to adapt to others doing things for me was a struggle. And also learning that not everyone understands what its like to be SICK. Cancer is about what most people think of when they think of being really really sick.... but in a lot of ways, cushings is worse/harder than cancer. Try not to bear the whole weight of the diagnosis and symptoms by yourself. It really helps just to let it out. Give yourself a break when you're having a crying day. You've had the strength to get through this before. You'll do it again. -- Praying for you.